Introducing Vaseline Intensive Care Healing Serum – a first to market body-serum which provides 10x the healing power to reverse dry skin damage and heal dry skin. This new formula contains three superior quality ingredients – PPAR Activators, Elastomers, and Vaseline Jelly – which work together to moisturize and heal dry skin. There are three variants included in this line: Deep Repair, Advanced Relief and Radiance Restore. Vaseline Jelly: Super hydrating! To help keep your skin feeling smooth (and not greasy), the product has micro-droplets of Vaseline Jelly. You'll get the benefits without the greasy feeling. These work together to help your skin heal and hydrate faster. Vaseline says that it "moisturizes to visibly heal dry skin by 10X over time". Vaseline sent both Deep Repair and Radiance Restore for me to try out. I've been using the lotions for almost a week now, mostly right after I wash my hands or after I get out of the shower, so the Vaseline Jelly micro-droplets can really seal the moisture into my skin. I love that it feels great on my skin. It leaves my skin soft and it doesn't feel greasy. It really does help to hydrate my skin, making my itchy winter skin feel much better! You can find the new Vaseline Intensive Care Healing Serums at retailers nationwide for $7.99. DISCLAIMER: All products received are complimentary for testing purposes from Vaseline. All opinions stated are my own and are not influenced by any affiliates. I always get Vaseline lotion for my husband. It's the only thing we've found that can keep his hands from cracking and splitting. I might have to get this for my s/o, he has problems with his hands getting really dry. This sounds like it would be great for him. With my keratin treatments, I am pretty sure I can't use this in my hair,l but I am a big fan of other Vaseline products! Love their lotions. I have to use Vaseline intensive care and recently tried the healing serum with great results. I recommend this to everyone because it's really amazing and my skin feels amazing once again. I love Vaseline products. Specially the new intensive care lotions. They work awesome on dry skin. I love the intensive Vaseline line, makes my itchy dry skin so much better! I have always been a fan of Vaseline! Such a great company. They have always made quality products! These sound really nice. I'm going to have to give them a shot. Vaseline is a brand that I really trust. I really need to try these. This Winter really did a number on my skin. It needs some healing! I use Vaseline this time of the year… They have great moisturizers for dry skin! Personally, I don't care much for the Vaseline brand lotions. I do however buy it frequently for my father as he works with his hands a lot and they dry out so harshly. Looks like a great product. My skin is so dry right now--could use it. Over the winter, my skin has suffered dryness. It's so severe that it itches so bad. I will look into this, it might help my skin. I love Vaseline products! I've been using them for years especially during winter. They work like magic on my skin. I like Vaseline products. I had good experience using their products. They are so good with healing dry skin. I haven't tried this new lotion yet. 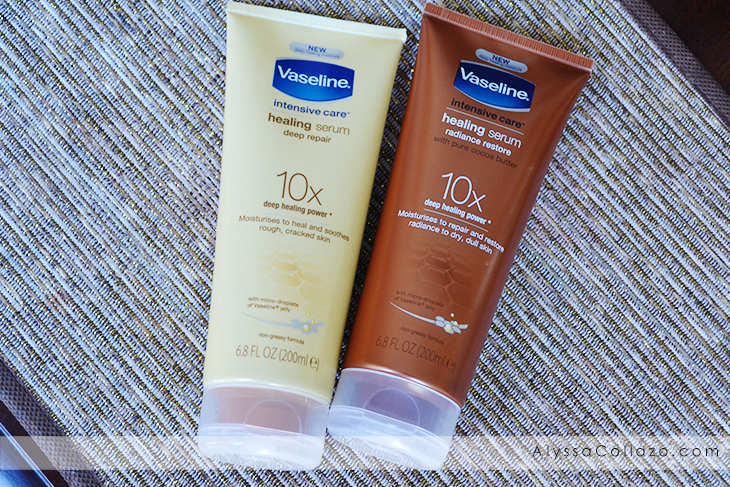 I have tried a few of the Vaseline lotions and i loved the results. I will have to try the Vaseline Intensive Care Healing Serum. My skin has been very dry this winter. My husband loves the Vaseline brand for lotion. He works outside and needs high quality because it tears his hands up. Love the vaseline products. Never tried this serum though. Wouldn't mind giving it a try some day. Thank you for sharing. We definitely could use this! Right now we mix Vaseline with our lotion to get moisturized correctly! I love Vaseline lotions but i think I need these serums for my hands! They are so dry and rough. I love these Vaseline lotions! The deep healing is my favorite it has brought my skin back a lot from winter. Vaseline is always a winner. I have used their lotion before but haven't seen this particular product yet. Thanks for sharing! We love this lotion. I have used it on my daughter and it works great. This sounds like some really good moisturizer! My hands had been rough all winter. THis would be the perfect thing for my skin, it gets so dry in the colder temps and colder weather. I have used Vaseline for many years, I have truly used it since I was young. This looks like a great new product to try.